In 2013, the traditional Georgian qvevri (kvevri) wine-making method was recognized by UNESCO as part of the Intangible Cultural Heritage of Humanity. The making of wine in qvevri is the oldest known method of wine production and it was from Georgia that wine-making in qvevri spread to Mesopotamia, Egypt, Greece and beyond. 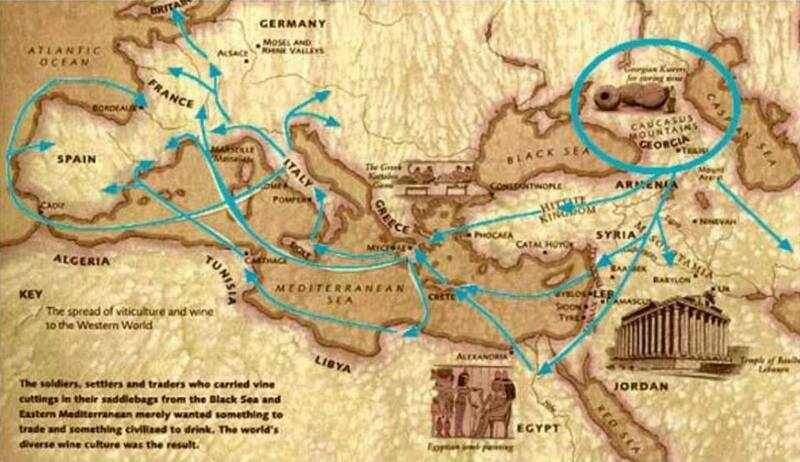 Map showing how the method of wine-making in Kvevri spread to Mesopotamia, Egypt, Greece and beyond. Qvevri are handmade from a special clay and are lined inside with melted fat or beeswax. The entire wine making process takes place within the qvevri, which is buried in the ground. 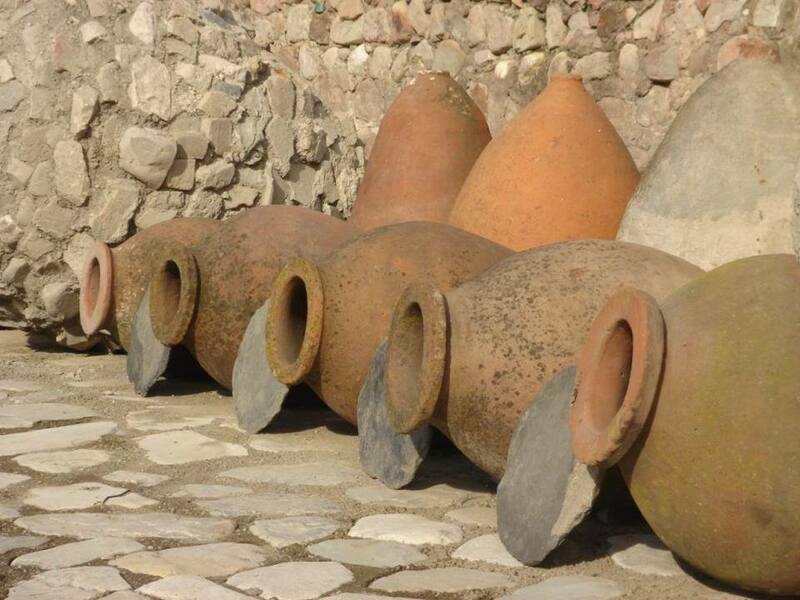 A good quality qvevri can be used to make wine for a hundred years or more, without affecting the flavor of the wine. The oldest qvevri, found in Georgia, are over 7,000 years old. UNESCO acknowledges that cultural heritage does not end at monuments and collections of objects. It also includes traditions or living expressions inherited from our ancestors and passed on to our descendants. 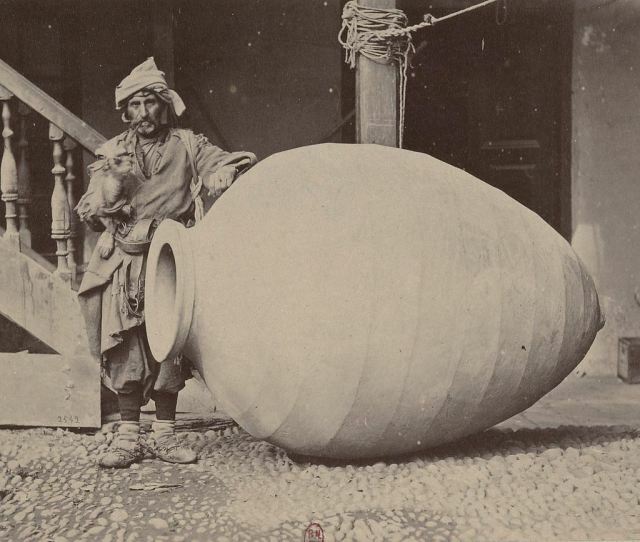 In adding the Georgian qvevri wine-making method, UNESCO acknowledged that, “The tradition plays a vital role in everyday life and celebrations, and forms an inseparable part of the cultural identity of Georgian communities, with wine and vines frequently evoked in Georgian oral traditions and songs. Knowledge of this heritage is passed down by families, neighbours and friends, all of whom join in the communal harvesting and wine-making activities”.